As fall arrives in Ellicott City, MD, squirrels prepare for the coming winter. You'll see these wild animals more during this time as they forage for nuts and seeds and bury acorns to eat later when food sources aren't as abundant. They also use this time to build nests and look for better areas to use as shelter – such as your home. 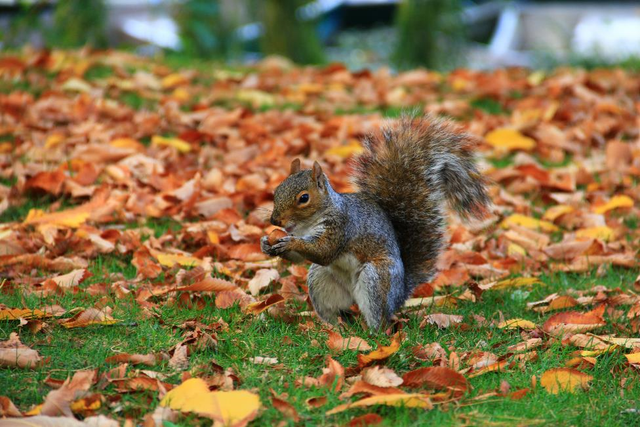 Why is a Squirrel So Active in the Fall? Ellicott City is home to thousands of gray squirrels. These wild critters roam freely in parks and neighborhoods throughout the year. In fall, they hoard as many acorns, seeds, and nuts as they can, eating some each day to put on extra fat for winter. If they're in your yard, you'll see these rodents bury food in various spots and return later in the winter to eat it. Does a Squirrel Hibernate in the Winter? Squirrels don't hibernate in the winter. Instead, they put on layers of fat and take refuge in their nests. They'll also hunker down with another squirrel or two for extra heat. When the temperatures drop, they'll all shiver together to create warmth in the nest. How Does a Squirrel Get Inside Homes? A squirrel will often invade attic spaces and build nests in the fall. Because heat rises, these rodents enjoy a warmer winter than they would if they had stayed in the trees outside. They get inside through attic vents and cracks in the eaves. They'll also invade basements or crawlspaces by slipping through the gaps around doors and windows. Squirrels are rodents and can cause a lot of damage to homes in Ellicott City, MD. They chew through walls, boxes, and wires and contaminate attic spaces with feces and urine. These pests also build nests behind the walls and give birth to young as the spring arrives. If you want to prevent this pest from entering your home, Connor's Pest Control can help. Our technicians provide wildlife management services to remove wildlife from your home. We also take preventative action to keep out rodents throughout the fall and winter seasons.